Bread that is delicious toasted and spread with lots of butter. I grew up with the English muffin; I know its habits. It comes from the grocery store, lives in the fridge, and has a thing for the toaster. It´s quirky: brown spotted, fork split, craggy faced. I didn´t pry. Then I tried to make one. Turns out the muffin has a background, a heritage, a past. I mixed a bread dough enriched with butter and milk. I patted it flat, punched out rounds, then read: griddle. Who knew? Anyone who´s made an English muffin, I suppose. Or who´s studied its lineage. 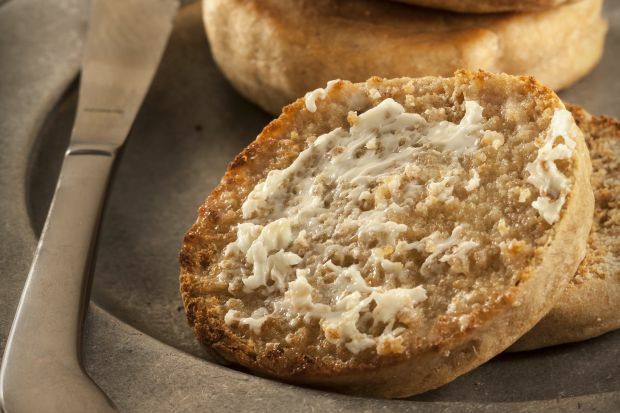 The English muffin is a direct descendant of the crumpet, a yeast-raised, griddle-crisped pancake. Turns out the English muffin is, well, English. Proof: In a large mixing bowl, stir together warm water and honey. Sprinkle in yeast. Let stand until creamy, about 10 minutes. Mix: Stir in milk, butter and whole wheat flour. Cover the bowl with plastic wrap, then a kitchen towel, and let rise in a warm spot, 1 hour. This wet dough (called a sponge) will bubble and, when poked, look something like a sponge. Rest: Whisk together salt and 1 cup all-purpose flour; stir in. Turn out and knead, adding a little flour if needed to achieve a soft but cooperative dough, 1 minute. Pat dough into a 2cm-thick circle, about 25cm across. Dust lightly with flour. Cover with plastic and let rest, 30 minutes. Cut: Punch out 7.5cm circles with a cookie cutter or drinking glass (re-pat scraps once). Crisp: Heat a griddle or cast-iron skillet over medium. Brush with salted butter. Griddle muffins until light brown, 2 to 3 minutes per side. Bake: Slip griddled muffins onto a baking sheet and slide into a 150°C oven. Bake until cooked through, about 8 minutes. Toast: Poke a fork around the perimeter of each muffin and pry open. (The fork method assures the most butter-catching crannies. Don’t use a knife!) Toast. Butter. Munch.